Even though the record has been lost because we changed blogs, Virginia has not forgotten her attempt at a “major-project-a-month” challenge for 2008. So, for April she has finished this. This is Geno from Rowan No. 43. She finished it just in time for the warmer weather we’ll be getting (at least I hope we’ll be getting). 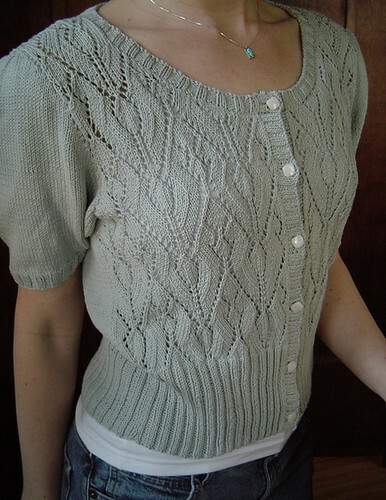 She knit this using Rowan 4-ply Cotton, and I wouldn’t be surprised if you see future projects made with it. Seriously lovely. Seriously. 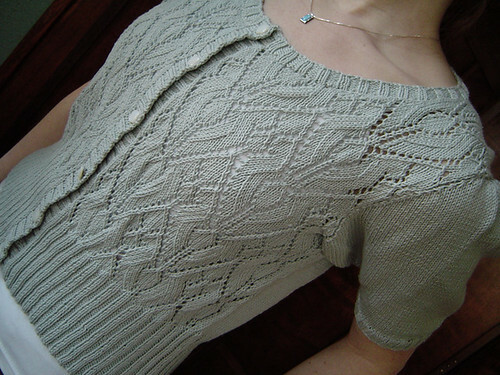 Lovely yarn, lovely work. Lovely pattern. Sigh. I could be done my April project, if I was to jam out and make it a shoulderette instead of a shawl. Sigh. 2 months behind. Thanks for feeling my pain Dan. The snow is finally melted, the sun shone today, and all is well. Everything you knit is so beautiful and lovely. And they always fit perfectly! I wish I could complete projects in as timely a manner as you! Can’t wait to see your next fo. (p.s.) Could those baked goodies look any more tempting? You both are incredibly talented. What is it that inspires us to use the word “lovely”? That’s the first descriptor that came to mind for me, too. 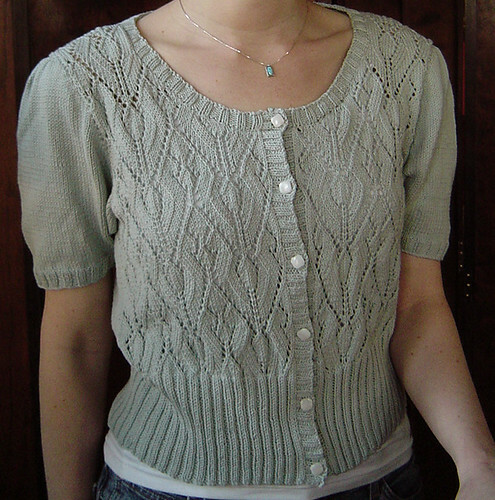 As Li said, the fit is superb – is V just built like a Rowan model, or does she make adjustments to the pattern? Oooh it’s so pretty! Very flattering on her too!